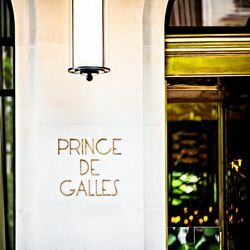 Built in 1928 in art-deco style, this timelessly elegant hotel is moments away from the Champs-Elysées. Known for its traditional approach to hospitality and exceptional level of service, it has welcomed many VIPs and celebrities over the years. From the moment you step into the airy lobby with gold-leaf chandeliers and superb marble floors, you know that your stay exceptional. Enjoy complimentary access to a fitness facility and a wellness space, in-room dining day and night, and much more. Savory snacks and cocktails await at the elegant bar, or opt for gourmet cuisine served at the restaurant.